Curtis Andrews is Newfoundland-born/raised, Vancouver-based musician with global persuasions. A percussionist/composer/educator/producer who creates music that is informed by his nearly 20 years of travels to West Africa (Ghana, Togo, Benin), Zimbabwe, and Southern India. 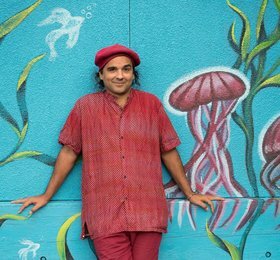 Besides being a fixture in the Vancouver world music community, he also leads his own rhythm-centric ensemble, The Offering of Curtis Andrews, which performs his original “world jazz” compositions and arrangements of known and unknown tunes from diverse sources.